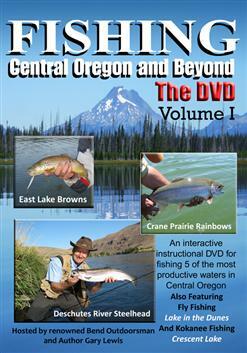 In this first volume, Fishing Central Oregon and Beyond the DVD offers viewers the opportunity interactively explore 5 popular bodies of water with guide tips and techniques, live fishing action and lake information including services and accommodations. When it comes to fishing Central Oregon no publication covers the where, when and how better than Fishing Central Oregon and Beyond. With over 200 lakes and streams and over 600 pictures and maps, it is regarded as the must-own guide for Central Oregon anglers. In this first volume, Fishing Central Oregon and Beyond the DVD offers viewers the opportunity interactively explore 5 popular bodies of water with guide tips and techniques, live fishing action and lake information including services and accommodations available at each location.